Short day as it was raining and the next promised to be beautiful and sunny so I elected to stay in Kelowna, which was only 350 km from Maple ridge. Maple Ridge to Hope on hwy 7 is awesome. Mountains, Prairie type valleys, and rivers. No pics as it was raining too much. C=5, R=7,T=3,V=8. Oh and Hope is where they filmed "First Blood" with Sylvester Stallone. A classic. Hope to Merritt on the Coquihalla ($5 toll road). I couldn't believe it. On each side of the toll both which sits in the middle of this section of road there are two completely different weather patterns! 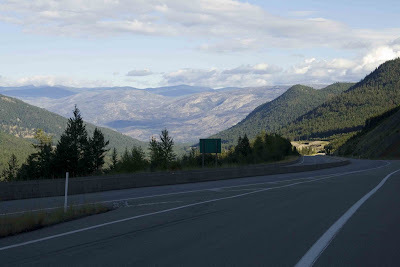 Hope to the Toll booth was and is usually rainy and that day was as low as 8 C. From the Toll booth to Merritt starting literally on the other side of the booth it was dry and temp of 13 C. I couldn't believe it and when I asked people in Merritt they told me it's usually like that. Wow. C=6,R=8,T=4,V=7. Cool Rainbow. Stayed behind the rain for most of this stretch stopping every once in a while and getting some good pics. 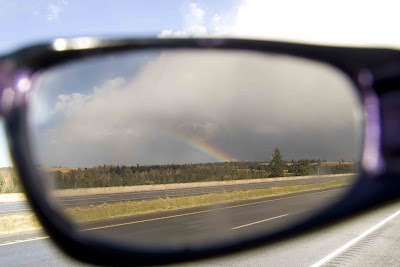 Sweeping decline in to the Okanagan Valley. Merritt to Kelowna C=6,R=7,T=3,V=8. Stayed at Samesun Bakpakers. Really good and got in to some drinking games with another 20 people. Went to Roses with a good group. Me and the Canadian version of Ben Affleck. Yet another cool French-cdn girl, Ariane.